Having decided to install an air source heat pump to heat your home, you will need to choose a qualified, experienced renewable energy specialist to install the technology. Renewables Guide recommends sourcing up to three quotes to make sure an air source heat pump is going to be the most suitable green heating option for you and your home. Obtaining a maximum of three quotes will also help you achieve the best possible price for the system. So once you’ve arranged an appointment with a heat pump specialist, what now? First thing’s first, let’s take a look at the questions you should be asking installers to help you separate the wheat from the chaff and find the right heat pump installer to meet your needs. We recommend that you choose an installer who is accredited with the Microgeneration Certification Scheme (MCS). While not all heat pump installers are MCS accredited because it can be a difficult and laborious process, if you don’t use an MCS certified installer you won’t be eligible for the Renewable Heat Incentive (RHI) and its financial incentives, which went live on 9th April 2014. Don’t forget that it’s not just the installer who needs to be accredited – the heat pump must be MCS certified, too. Who is responsible and liable for the installation? It’s important to know who is going to be responsible and have liability for the renewable energy system you are having installed. According to the Energy Saving Trust installations may involve the services of a variety of specialists, including a ground works contractor, a plumber and an electrician as well as the heat pump installer, so you need to know who exactly is actually liable for the system. Ideally choose a company who will take sole responsibility and liability, and make sure you have a contract for after sales service to give you peace of mind should any issues occur afterwards. How experienced is the installer? As has been determined from the Energy Saving Trust’s heat pump field trials, heat pumps are sensitive to design and commissioning. If the system is incorrectly installed it won’t perform well. So it makes sense to choose an installer who has a lot of experience under their belt. Find out how long the installer has been trading for and how experienced they are – in other words, how many air source heat pumps have they installed. Where possible get recommendations from family and friends, or even work colleagues. Renewables Guide customers are able to leave feedback, so it’s worth taking into consideration genuine testimonials from happy (or not so happy) customers to help you make an informed decision. How is your home heated? Radiators? Underfloor heating? It’s an important question because the answer will determine the heat pump’s efficiency and performance, which will have an impact on your heating bills and subsequent payback. The heat pump needs to perform efficiently over its lifetime if you are to achieve a good return on your investment. Is the property well insulated? Your home will need to be insulated to building standards. Insulation will impact on a heat pump’s performance. For heat pumps to be suitable and cost effective they should only be installed in a well insulated building. What area of the property is to be heated? By providing the installer with information about the overall area that requires heating they will be able to determine the size of the heat pump, particularly in the absence of a Standard Assessment Procedure (SAP). How does the heat pump work? 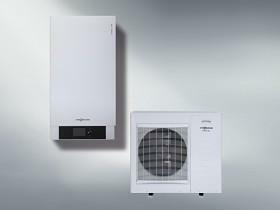 Ask the installer how your existing heating and hot water system will work with the heat pump. Make sure the installer demonstrates the heat pump’s controls which will allow you to get the best out of the system. A well performing heat pump should achieve a CoP of 3 at the very least; meaning that for each unit of electricity used the system will produce three units of heat energy. And don’t forget to ask how the installer has determined the type and size of heat pump to install, and how heat demand was calculated. The system needs to be sized correctly if it is to meet the property’s central heating demand. Also, don’t forget to ask about running costs. What sort of noise levels will the heat pump emit? A complete air source heat pump system usually consists of a heat pump which tends to be sited outside a property directly on the floor, and an air handling unit which is sited inside the property. The air handling unit can emit up to 50 decibels of noise, much like that of an American style fridge. Your installer should be able to provide you with this information. Air source heat pumps are now classed as permitted development and therefore aren’t subject to planning permission. However, you should still always check with your local authority planning office. Air source heat pumps should last for at least twenty years, as long as they are properly maintained and serviced annually. Your installer should provide at least 12 months warranty. So check what sort of guarantee is provided for the installation work and the product itself. Most installers will offer anything from a five to a ten year warranty, and even carry out annual maintenance in the first year at no extra charge. What’s included in the total price? To install an air source heat pump you can be looking at anything between £5,000 to £9,000 depending on the size of the system and the work involved. Before you sign a contract, make sure you have a comprehensive written quotation which details every aspect of the work you will be paying the installer to undertake. For example, if you want to install a new heating system (under floor heating) you’re looking at an extra cost of around £2,000 on top. Up until the end of March 2014, you could apply for the Renewable Heat Premium Payment scheme. The Government incentive provided a one-off payment to help fund the installation of renewable heat technologies. Air source heat pumps qualified for a one-off grant of £1,300. Remember knowledge is power. So if in doubt, ask. Get recommendations from previous customers and preferably those who have had their heat pumps installed for at least 12 months. Don’t sign anything without reading it through thoroughly – especially the small print! Get three quotes to compare prices. Make sure the installer is certified with MCS. This is a must for the RHI. Don’t be fooled into thinking that the cheapest quote is the best quote. Just because it’s going to save you a bit of money in the short term doesn’t mean it’s the best one. To source free quotes from MCS accredited air source heat pump installers local to you, fill out a quote form today. Renewables Guide can provide you with a maximum of three quotes, there’s no obligation and best of all it’s completely free.